We are pleased to say we have our Coffee Mornings at Enfield Mencap, twice a month on Tuesdays and Thursdays to support Parent/Carers that cannot make certain days. We do appreciate Parent/Carers have commitments but if you are free please come along as it’s always nice to see you. It is a very informal event where Parent/Carers can get together and share information with one another. Thank you all very much for your support and we do fully understand when a Parent/Carer cannot make some days but feel free to come to any other days you can. Below are the dates and times; hopefully you will be able to attend one or more sessions. Feel free to attend as many as you want if you can attend all of them even better!!! Between the 10h and 14th June 2019 is carer’s week. Enfield Carers Centre is here to support you in your caring role. It offers a wide range of services including: free training and information, advocacy, respite activities and counselling as well as many others. Give the Centre a call or pop in for help. See the Centre’s latest newsletter here, including on page 8 the good news of the return of Saturday Respite. 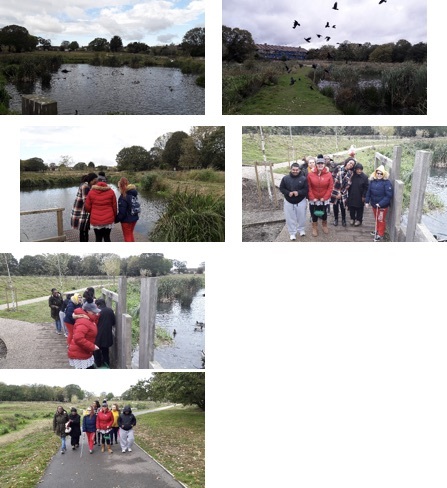 On 22nd October we went to Firs Farm Wetlands, Firs Lane, Winchmore Hill, London N21 2PJ. We fed the ducks and it was an amazing morning; the guys really enjoyed themselves. 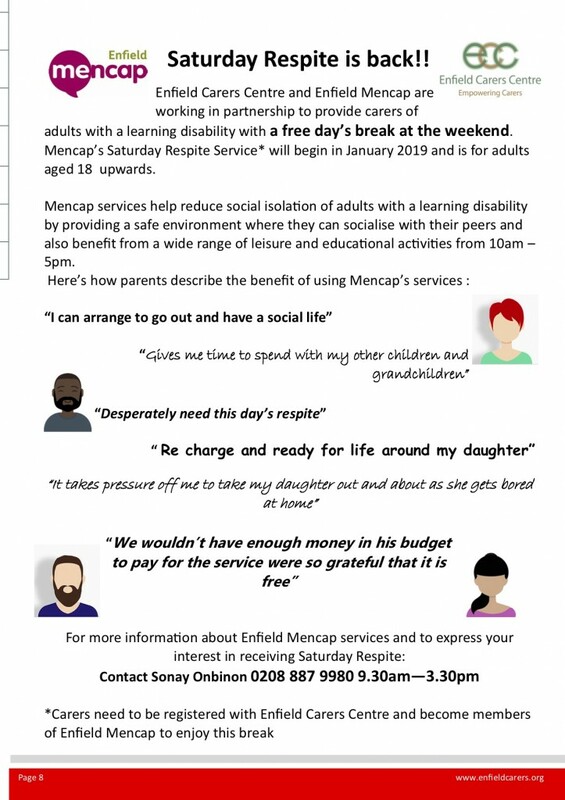 We have fun, fun and more fun at Enfield Mencap. 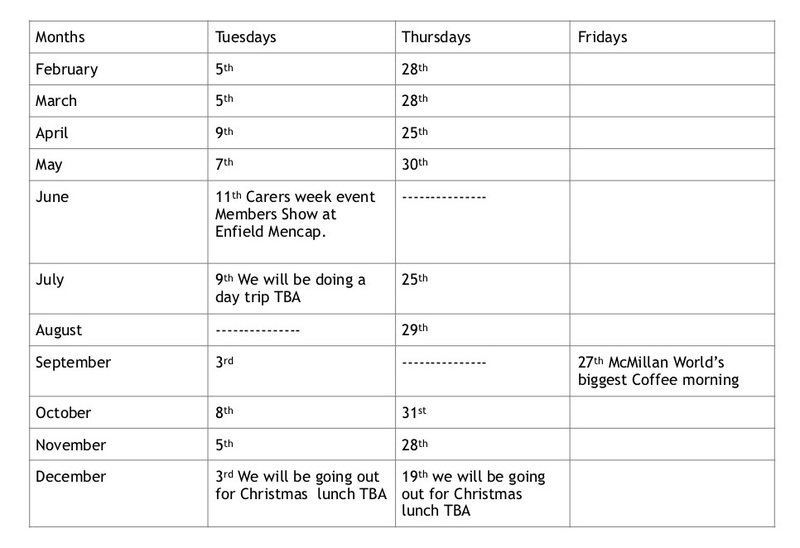 Here’s an update for Parents and Carers about the couple of coffee morning dates left in 2018. Thursday 15th November 2018 10am to 11.30am: the topic will be a discussion of where you would like to go on our day trip out for Christmas. Thursday 13th December 2018: all day trip out 10am to 2.30pm. We are looking forward to seeing you at these coffee mornings. Coffee mornings will continue in 2019 and I will be sending dates for those in the near future. 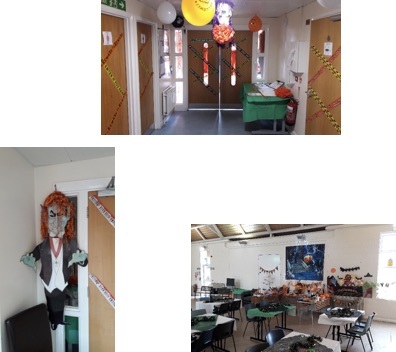 Here are some pictures of our Halloween party at Mencap. We would like to thank one of our board members, Mr Stuart Livermore, for donating all the food and party stuff for the party and also Val and Tracy for organising it. Also, a huge thank you to all members and staff that made it a fantastic day well done. I would like to thank all parents/carers for coming to our 3rd year event of “World’s Biggest Coffee Morning” which we held here on Friday 28th September 2018. We raised £119.60p for the great team of McMillan nurses. Thank you to everyone; it was so nice to see parents/carers at our coffee morning and where parents/carers could not attend this event they either baked a cake or sent some cakes in to sell and donated money. I would like to say thank you to all staff members for making this day work, also our members where they worked very hard at baking!!! Here are some pictures and we will be holding this event every year; the McMillan nurses do a wonderful job. We do hold coffee mornings once a month and letters are going out with more dates, so if you are free do please come along. They are nice chilled out coffee mornings and if you have any ideas please feel free to come forward as we are always open to suggestions. Our next coffee morning will be on Thursday 15th November and we will be discussing where we will be going out for our Christmas lunch. I hope you can make these dates. Transition and Family Liaison Officer. Click here to nominate Enfield Mencap as one of Asda Edmonton’s three local good causes. You can find the Nominate link on the right hand side of their home page (you may have to scroll down a little). If Enfield Mencap is chosen, you will be able to use your green tokens to vote for us when you shop in the store. Gatwick Airport has launched a lanyard for passengers with hidden disabilities who may require additional support when travelling through the airport. The lanyard, which is voluntary for passengers with hidden disabilities and their families, will act as a discreet sign for staff that additional support or help may be required. It was launched at Gatwick Airport as part of Dementia Awareness Week (15-21 May), and is supported by charities including the Alzheimer’s Society, The National Autistic Society (NAS) and Action on Hearing Loss. Gatwick Airport has been working closely with charities and OCS, which provides passenger assistance services at Gatwick, to promote greater awareness and understanding of the challenges passengers with hidden disabilities can experience when travelling through busy environments. As part of the initiative, Gatwick is increasing awareness and training of airport staff and appointing ‘workplace champions’ to provide enhanced assistance for passengers with hidden disabilities. Gatwick’s commitment follows its support of the Prime Minister’s Dementia Challenge and the airport’s involvement with the Air Transport Group to improve the travelling experience for all passengers with hidden disabilities. • Benefit from a more comprehensive briefing on what to expect as they travel through the airport.